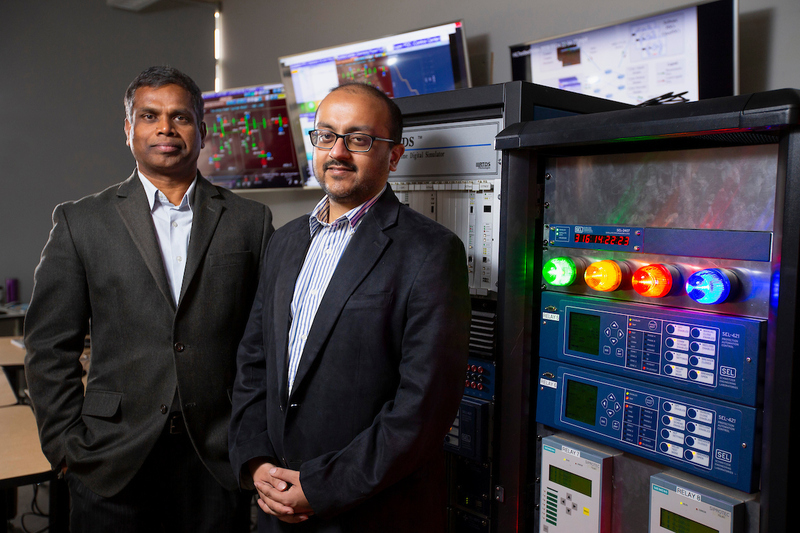 Iowa State engineers, left to right, Manimaran Govindarasu and Sourabh Bhattacharya are developing tools to protect the power grid from cyberattacks. Larger photo. Photo by Christopher Gannon. AMES, Iowa – Threat levels for cyberattacks on the power grid are usually labeled high, medium or low. Well, that’s not good enough for a team of Iowa State University engineers. Iowa State's Manimaran Govindarasu and Sourabh Bhattacharya are turning to game theory to help quantify threats of cyberattacks on the power grid. They're also developing cybersecurity tools that could help protect the grid and could be adapted to other cyber-physical infrastructure such as oil, natural gas and transportation systems. Their research is supported by a grant from the National Science Foundation.